The Hobo Nest: An Update. 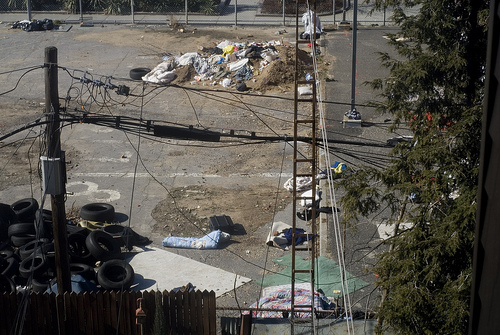 Some of you may remember The Hobo Nest. This post is a brief update as to what’s been happening since last February when he first arrived. A couple of months ago we woke up to find a pile of tires where the nest used to be. We’re not sure who put them there or why. A couple of weeks later, the hobo got drunk, freaked out and threw them all over the parking lot. He put them all back again the very next day. Since September he has made a mess of the entire parking lot, adding a bunch of trash to the dirt pile that was once pristine. We watched someone deliver a futon frame a couple of weeks ago. One of his many mattresses is now off the ground. That particular bed is sitting behind the tree alongside the house perpendicular to ours. At one point, he also had a small bedside table as well as a lamp. The lamp never actually worked. Right around December a construction company dropped off a port-a-potty. At roughly the same time, the hobo showed up wearing an orange jacket sporting the word “SECURITY” on the back of it, which is pretty brilliant if you ask me. 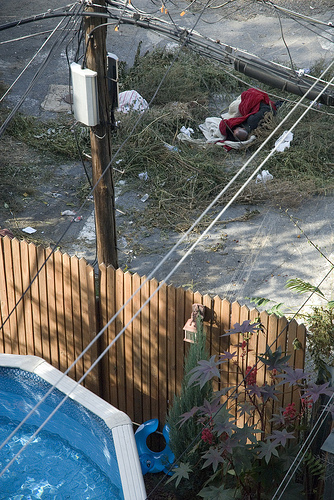 He is still very much drunk and dying in the parking lot directly behind our backyard. Next Post Monday Morning Madness. I just went back and read your first post on the hobo nest and then your update. WOW. Thank you for posting things that challenge the way I think and put me outside my comfort zone. You’re writing is incredible and brave and you have my complete admiration. We just moved from an apartment downtown. It’s hard to find a common ground between your sadness for homeless people and your fear and about having them around. I’m impressed by the way you write about him with compassion. I would have a very hard time doing the same. My brother, whom I’m not even sure is still alive, has been homeless for nearly 20 years. He told me once that he just couldn’t fathom going to work every day, keeping up with a bank account, and paying rent and utilities just to have somewhere to live. I imagine his feelings were not unique among the homeless set. My brother, like a lot of homeless people, struggles (struggled?) with mental illness and substance abuse. Mel: I am so sorry to read about your brother. I really am. jenB: When I first wrote this story, I was directed to someone at the NYT. I never got around to sending the pictures or telling the story. I am the worst whenever it comes to that sort of thing. “Security” is brilliant. I think I need one of those jackets. You never know when it’ll come in handy. I heard a homeless man tell his story on NPR’s Story Corps this morning. He was homeless for 12 years, but he’s been off the street for 10. It was illuminating, haunting, lovely. Much like your hobo nest story. I don’t know why I think it’s lovely – maybe because it’s told frankly, without overblown sentimentality or strident moral pronouncements. You just tell us what you see. Very moving. The juxtaposition between the swimming pool on the one side of the fence and the hobo on the other is striking. But I suppose that’s what juxtapositions are for. oh god, that’s just… crazy.